An American cameraman working in Liberia has tested positive for Ebola. The 33-year-old freelancer is to be flown home to the US for treatment. The unnamed cameraman has been working in Liberia for three years for a number of media outlets, most recently NBC News. 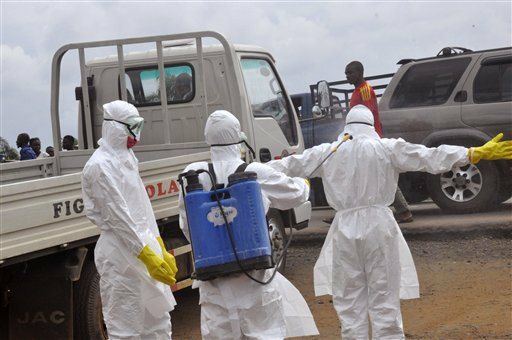 More than 3,330 people have died in four West African countries in what has become the world’s worst outbreak. President Barack Obama has pledged federal support to contain the spread in the US, after the first case there. A Liberian man diagnosed in Texas on September 30 remains in a serious condition. The cameraman is the fourth American known to test positive for Ebola, all diagnosed in Liberia. Three American aid workers were separately flown back to the US for treatment and they are all recovering. The cameraman was only hired by NBC News on September 30, the broadcaster said, and he came down with symptoms – including fever and aches – the following day. After seeking medical advice, he tested positive for the virus. NBC News President Deborah Turness informed staff of the news in a statement. The rest of the NBC crew including the network’s chief medical editor, Dr. Nancy Snyderman, are being flown back to the US on a private charter flight and will be placed under quarantine for 21 days, Deborah Turness added. Meanwhile, as many as 100 people in Texas are being checked for exposure to Ebola, after Thomas Eric Duncan, a Liberian national, was diagnosed with the virus in Dallas. Thomas Eric Duncan flew to the US two weeks ago to visit relatives. A number of them have been ordered to stay home while they are watched for signs of the disease. Dallas Mayor Mike Rawlings was called by President Barack Obama on October 2 who promised to help with whatever was needed from federal resources to stop it spreading. Thomas Eric Duncan was the first person diagnosed on US soil and on October 2, Liberian officials said they would prosecute him for lying on an Ebola questionnaire form prior to leaving the country. The Ebola outbreak has prompted dire warnings of economic collapse in West Africa if infection rates continue. There have been 7,178 confirmed Ebola cases in total, with Sierra Leone, Liberia and Guinea suffering the most.